Latin America is a vast and ample soundscape that is an endless source of inspiration, fusion and novelty. This month, Peruvian natives Novalima and their ever evolving sound will bring us a taste of global fusion with an amazing Peruvian flair right here in Washington DC. Kesta Happening caught up with the group and asked them a few questions about their sound and upcoming visit to the DMV. Here’s what the band wants you to know. NL: It’s a remixed version of our previous album KARIMBA. For this album we asked a few producers and DJ’s that we like to re interpret our songs. On this album the choice of remixers also reflects Novalima’s global appeal in the Latin diaspora worldwide. The UK is represented with well-known West London producer Seiji’s, Brazilian supergroup Da Lata and Xakosa. We also have a few US based producers from around the country. California is heavily represented with remixes from KCRW / AfroFunke DJ, Los Angeles mainstay Jeremy Sole, Acid Jazz legend DJ Smash, Bay Area veteran band Afrolicious, LA/NYC DJ Sabo, Thievery Corporation’s Rob Garza, NYC DJ producer and Wonderwheel label head Nickodemus and few other great producers. As an added bonus, the album contains one brand new, unreleased Novalimatrack – “Payande”. KH: Tell us a little about your history. How did it all start? What’s the story behind the name? 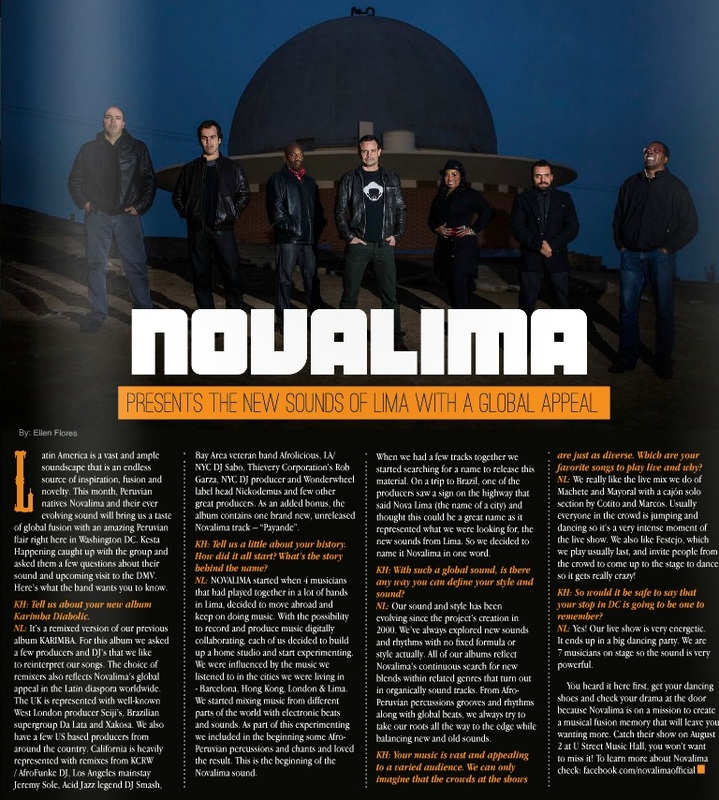 NL: NOVALIMA started when 4 musicians that had played together in a lot of bands in Lima, decided to move abroad and keep on doing music. With the possibility to record and produce music digitally collaborating, each of us decided to build up a home studio and start experimenting. We were influenced by the music we listened to in the cities we were living in – Barcelona, Hong Kong, London & Lima. We started mixing music from different parts of the world with electronic beats and sounds. As part of this experimenting we included in the beginning some afro Peruvian percussions and chants and loved the result. This is the beginning of the Novalima sound. When we had a few tracks together we started searching for a name to release this material. On a trip to Brazil, one of the producers saw a sign on the highway that said Nova Lima (the name of a city) and thought this could be a great name as it represented what we were looking for, the new sounds from Lima. So we decided to name it Novalima in one word. KH: With such a global sound, is there any way you can define your style and sound? NL: Our sound and style has been evolving since the project’s creation in 2000. We’ve always explored new sounds and rhythms with no fixed formula or style actually. All of our albums reflect Novalima’s continuous search for new blends within related genres that turn out in organically sound tracks. From afro Peruvian percussions grooves and rhythms along with global beats, we always try to take our roots all the way to the edge while balancing new and old sounds. KH: Your music is vast and appealing to a varied audience. We can only imagine that the crowds at the shows are just as diverse. Which are your favorite songs to play live and why? NL: We really like the live mix we do of Machete and Mayoral with a cajón solo section by Cotito and Marcos. Usually everyone in the crowd is jumping and dancing so it’s a very intense moment of the live show. We also like Festejo which we play usually last, and invite people from the crowd to come up to the stage to dance so it gets really crazy! KH: So would it be safe to say to that your stop in DC is going to be one to remember? NL: Yes! Our live show is very energetic. It ends up in a big dancing party. We are 7 musicians on stage so the sound is very powerful. Get your dancing shoes and check your drama at the door because Novalima is on a mission to create a musical fusion memory that will leave you wanting more. Catch their show on August 2 at U Street Music Hall you won’t want to miss it!